Thou shalt not Facebook for more than 15 min per workday. Thou shalt not print flyers for your child’s school play in color. Thou shalt not wait until 5 min before a presentation to senior management to disclose that you don’t know how to transition slides in ppt. Action Plan – These are usually created for employees that are struggling. It is the equivalent of receiving 3 demerits in one semester. Let’s call an Action Plan what it actually is – a save your job plan. Everyone rushes home to tell their spouse about a promotion or recognition – no one rushes home to tell their spouse they had a great day developing an action plan. Action plans are usually created for someone that didn’t actually take action. Outside the Box – This is my absolute favorite. When all else fails, call a meeting where everyone can “think outside the box”. I guess this is a nice way to say – your original ideas were pretty vanilla. Can anyone give us a new idea? Can anyone bring us something that expands beyond the 4 walls that are holding us in this conference room? Let’s brainstorm or white board it! Maybe Hallmark should make a card line specifically based around corporate buzz words. 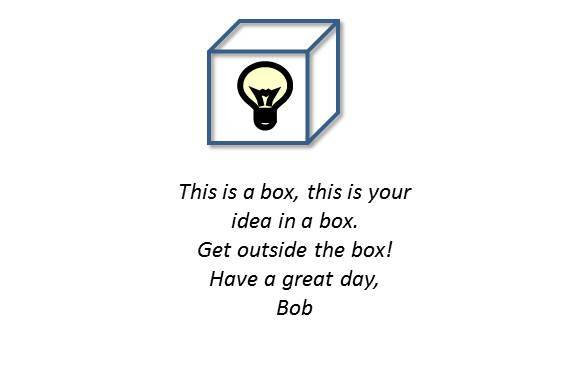 Wouldn’t it be fantastic to come to work and provide a co-worker with an Outside the Box card?